Portadown skipper Kevin Braniff has been fined and placed on the transfer list for what the Premiership club has described as a breach of discipline. The surprise move comes two days after the Ports were hammered 4-0 by Ballymena United in the quarter-finals of the League Cup. In a newspaper interview, former club skipper Braniff revealed he had earlier had a row with manager Ronnie McFall. The striker said he felt he had been singled out by the veteran Ports boss. Portadown, who were early-season leaders in the Irish Premiership, have slipped to sixth in the table following a poor run of results. It included a 4-2 defeat at home to Mid-Ulster rivals Glenavon in a live TV game and Braniff said he had a bust-up with manager McFall after that game. "We had an argument in the changing room and, since I started asking questions about our tactics, it seems everything has been my fault," former skipper Braniff told the Portadown Times. "On Tuesday at Ballymena I did not feel I was the worst on the pitch so my reaction was out of frustration at everything. "Other players are not good enough, and have not been good enough, but all the problems suddenly came down to me. "I reported for training as usual on Thursday night but was told a team meeting would be held and I had to stay away. "I have been fined and told to stay away from the club. "I love it at Portadown and love playing for the club, but I do not see any future with Ronnie McFall as manager." 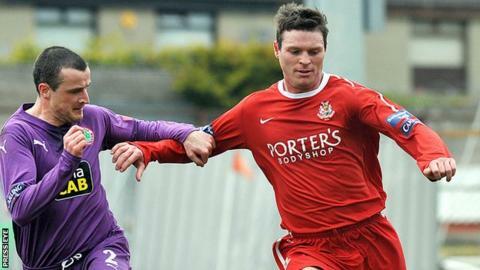 A statement from Portadown said: "Team captain Kevin Braniff has been made available to other clubs. "Braniff, one of the most technically gifted players in the Irish League, is being made available either in a straight cash, player exchange or cash and player deal. "Although he cannot move until the January transfer window, the club are open to offers." Braniff, 30, has been with Portadown since December 2006, having started his career with Millwall, and he is regarded as one of the Irish League's most skilful players. In 2010, he won a senior Northern Ireland cap under Nigel Worthington, playing in a friendly against Turkey in the United States.